These tapes are based on a silicone rubber coated rayon fabric to which has been applied a synthetic rubber adhesive. One grade has a napped (pimpled) surface and the other is smooth. The tape surfaces are highly resistant to clogging and prevent build-up of adhesive or other deposits on web transport rollers. They are ideal for wrapping over transport rollers as used in the converting industries. The surfaces have extremely low friction to prevent stretching or sticking. Chemical constituents: Single sided self adhesive tape, made from cloth, silicone rubber and natural rubber based adhesive. A white silicone coated paper is used as a liner. Skin: If inflamed or irritated, consult a doctor. Environmental precautions : Do not allow leakage into the environment. 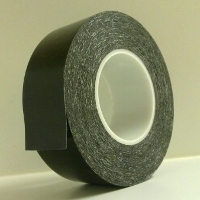 Colour: Tape appears to be black du to black cloth. The silicone rubber on the back side is transparent. The paper liner is white. Solubility in water: Almost insoluble. Solubility in organic solvents: Is soluble partially or totally depending on the solvent used. Stability: Stable under normal conditions of use. Serious toxicity / Local effects: All the ingredients are essentially non-volatile and of negligible toxicity. The major ingredients can be regarded as essentially harmless. Mobility: Solid product with reduced mobility.